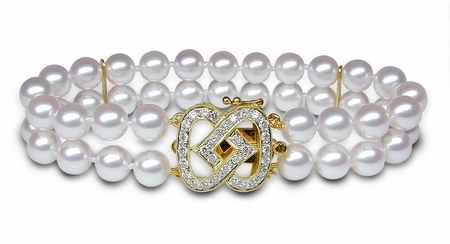 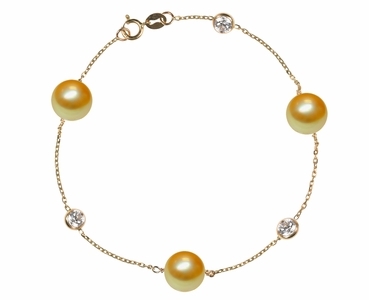 A pearl bracelet is a classic item that can be an accessory to a pearl necklace, earring or pendant set. 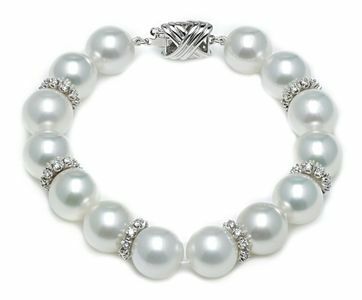 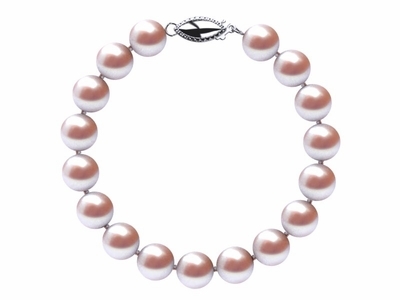 In addition, pearl bracelets are also popular as for wedding jewelry. 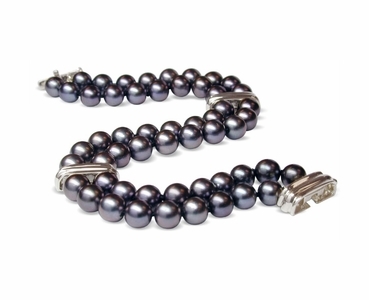 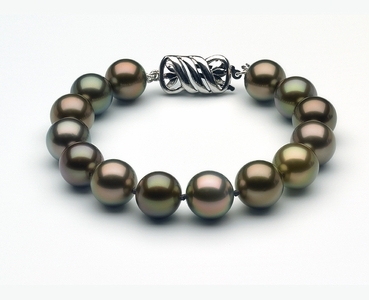 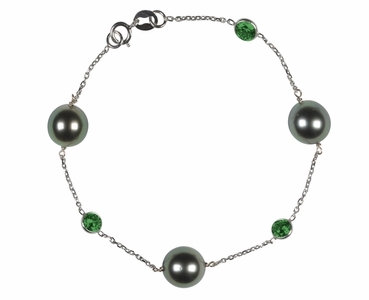 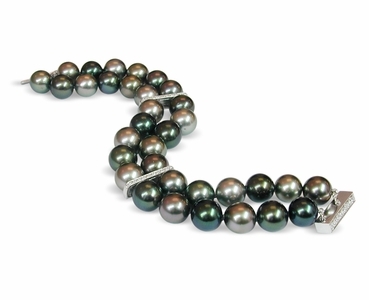 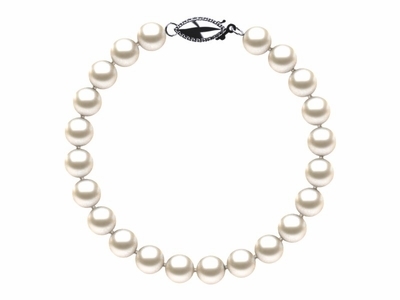 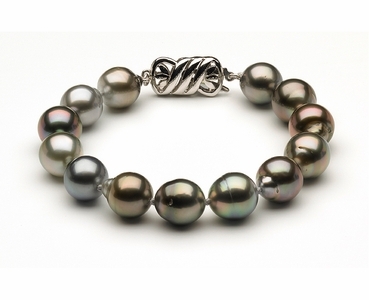 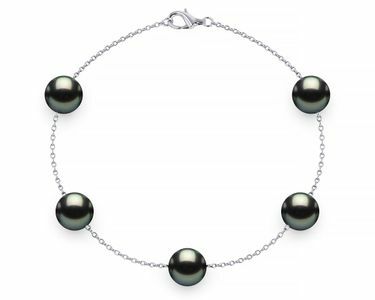 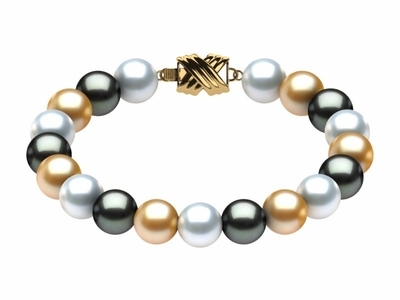 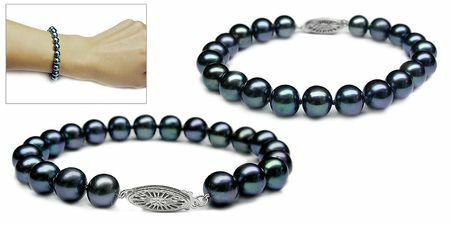 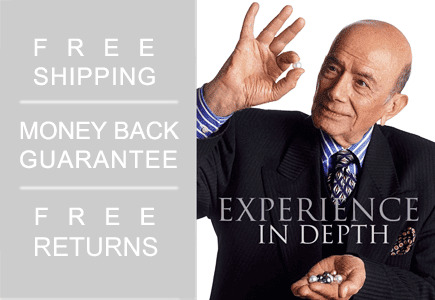 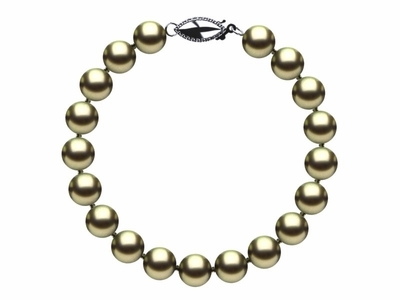 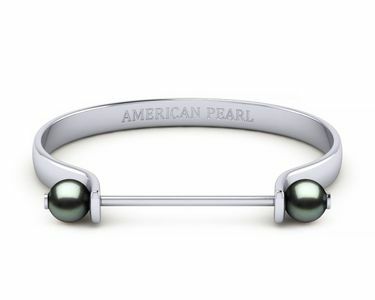 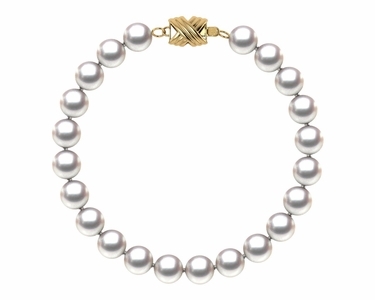 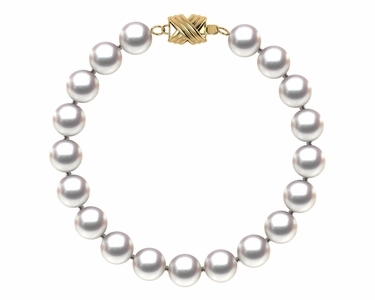 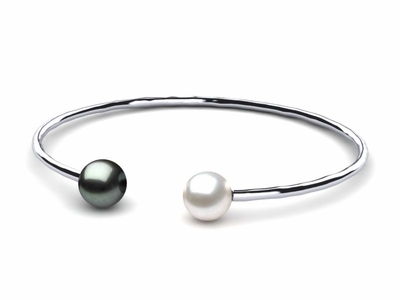 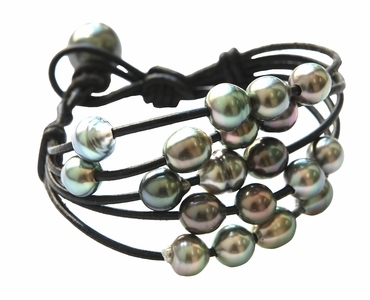 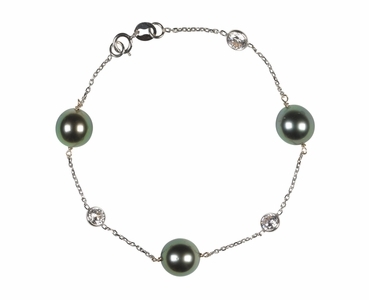 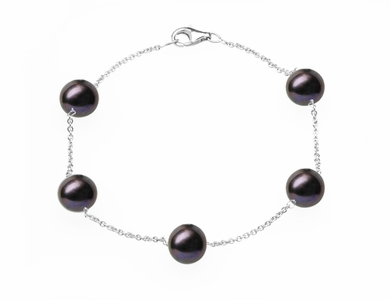 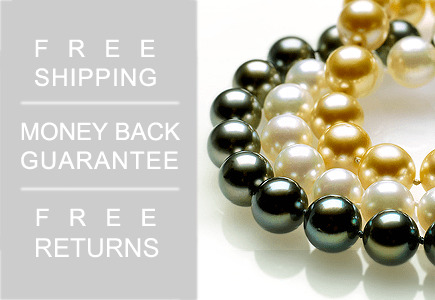 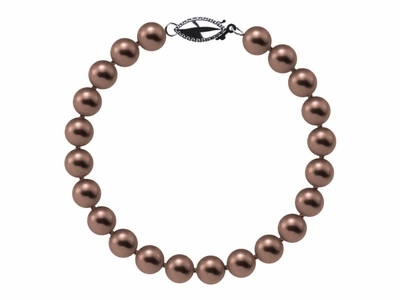 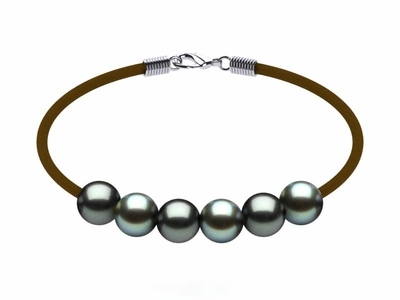 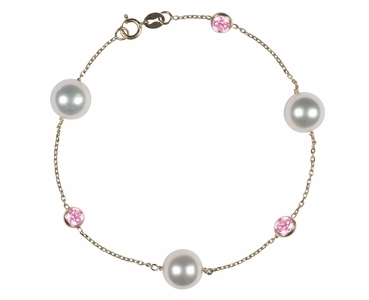 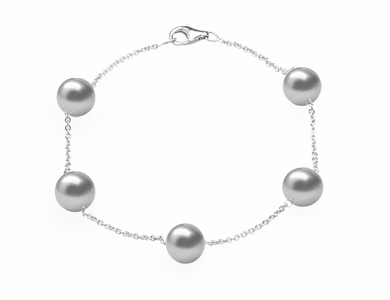 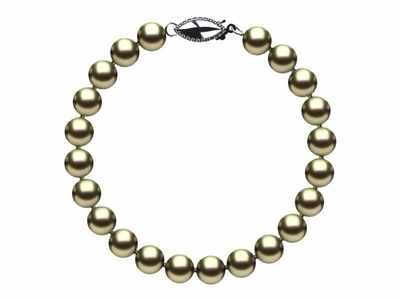 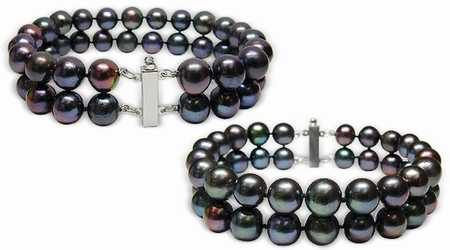 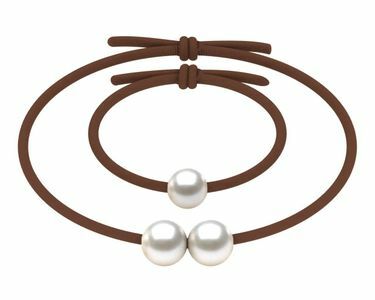 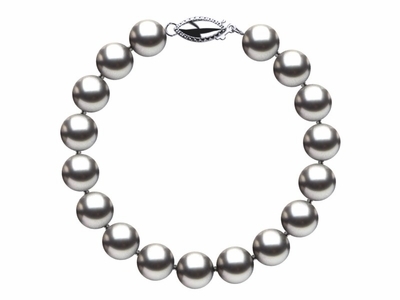 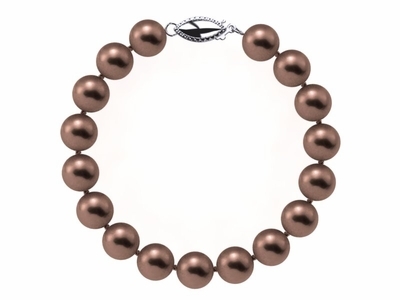 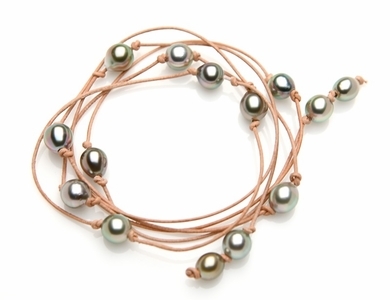 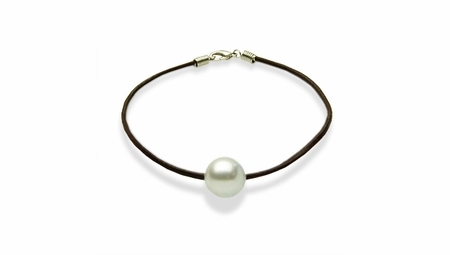 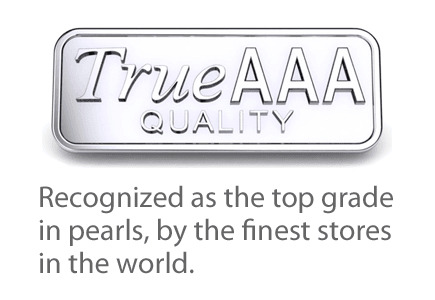 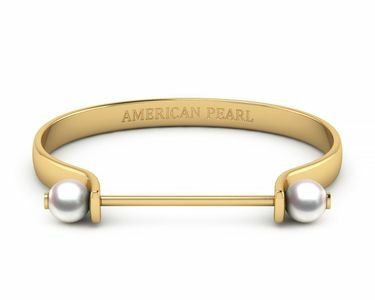 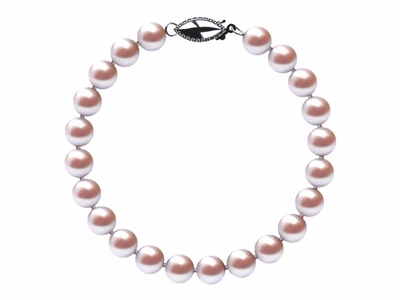 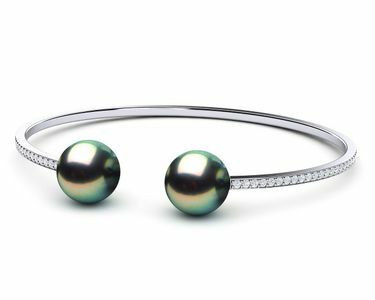 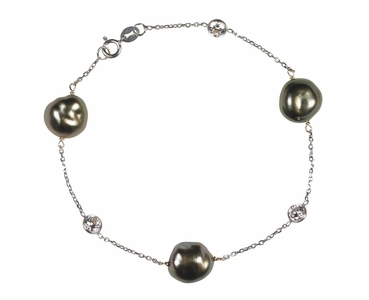 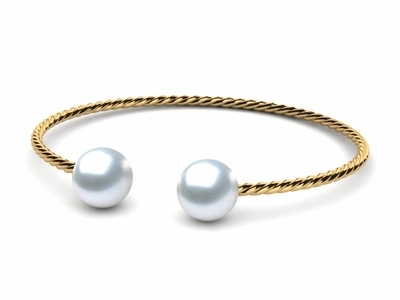 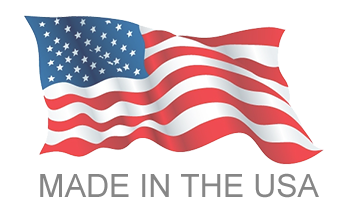 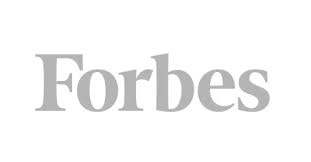 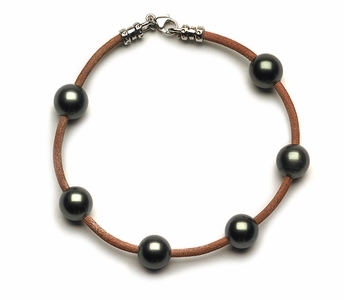 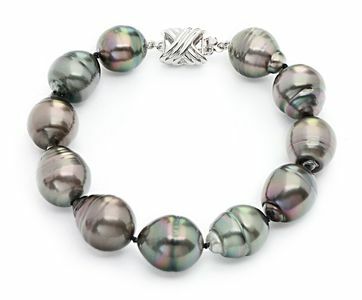 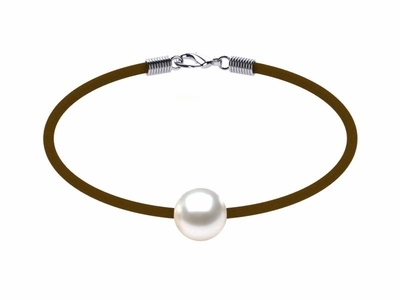 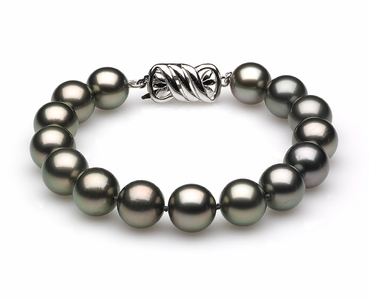 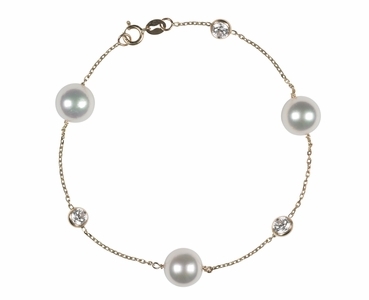 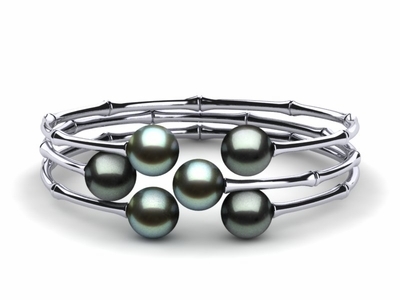 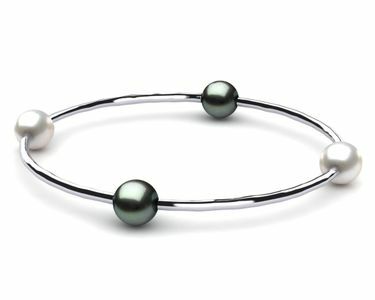 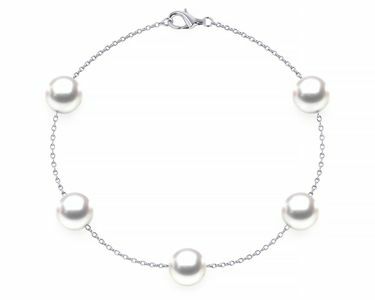 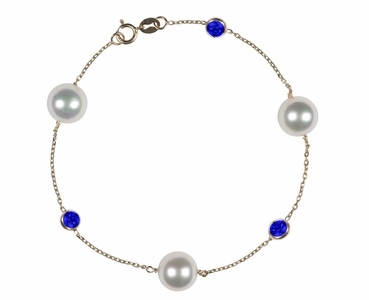 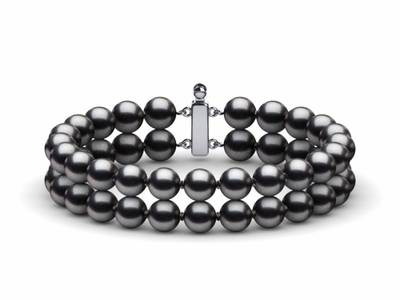 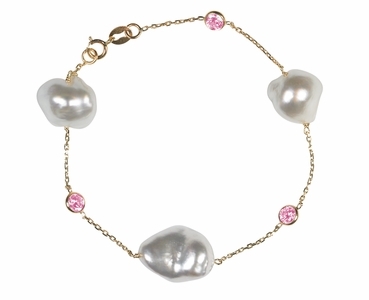 Whether you a looking for a classic simple single strand, a double strand, Tahitian pearl, south sea, freshwater or tin cup pearl bracelet, American Pearl has the world's largest selection at truly wholesale prices. 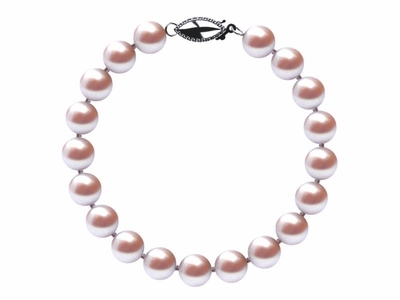 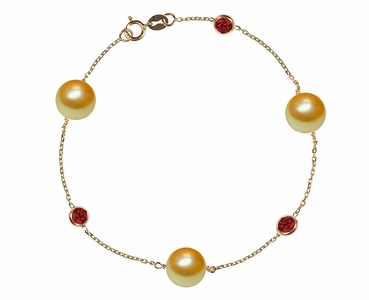 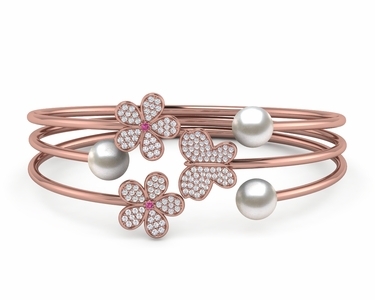 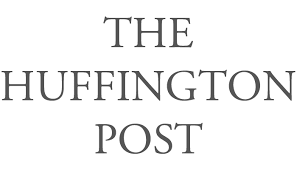 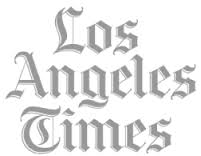 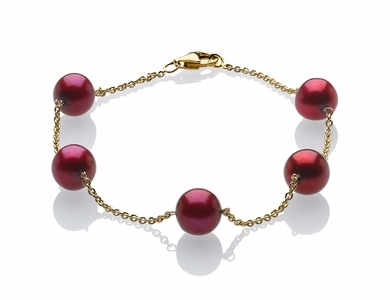 A pearl bracelet is an article of pearl jewelry that is worn around the wrist. 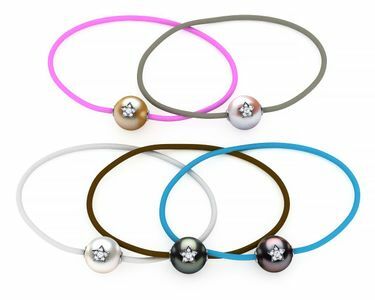 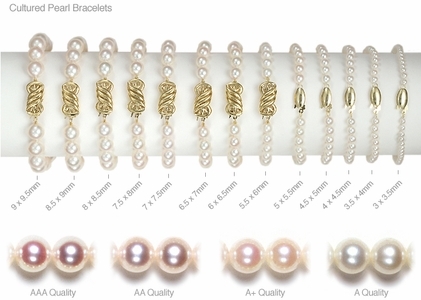 There are many kinds of pearl bracelets from single strand bracelets to multi strand pearl bracelets. 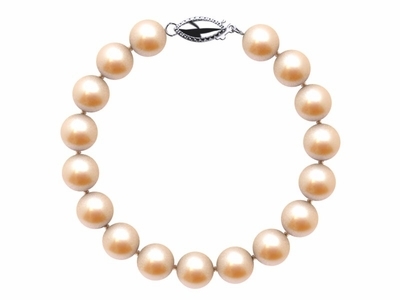 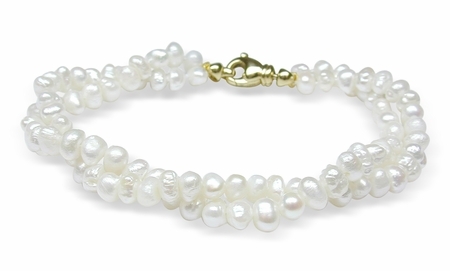 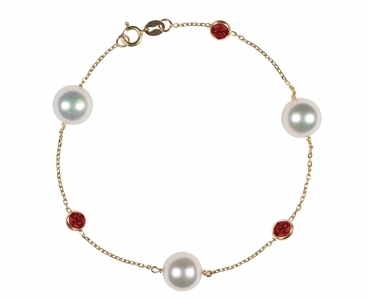 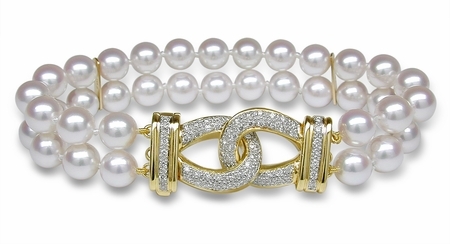 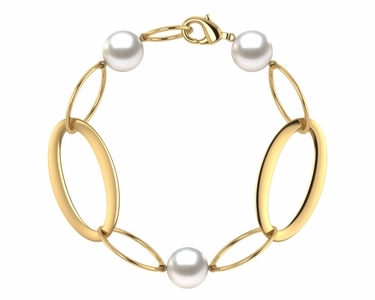 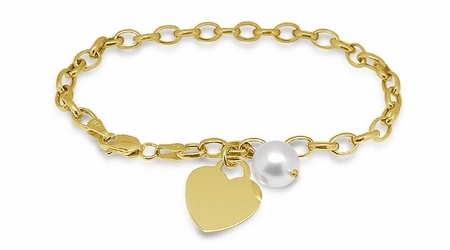 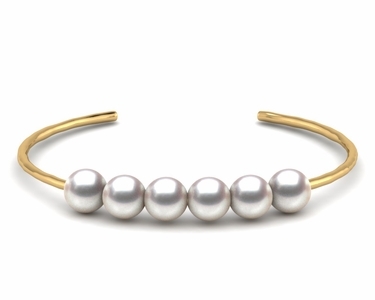 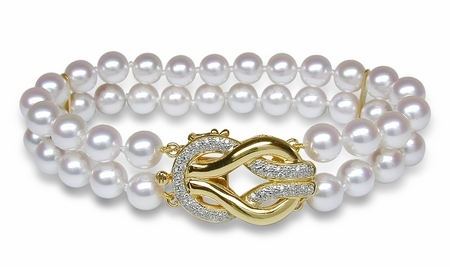 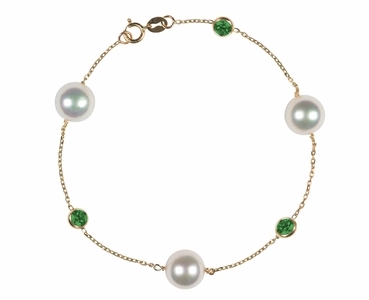 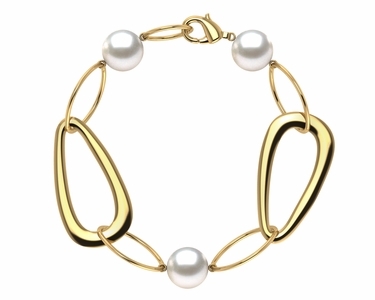 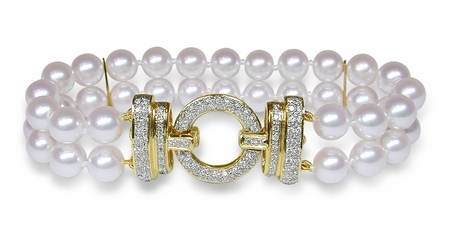 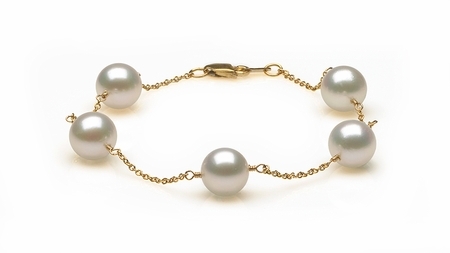 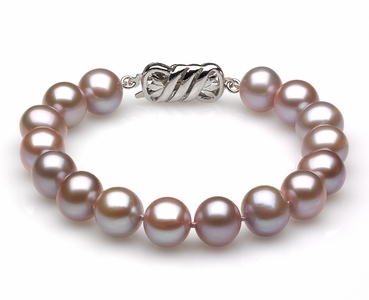 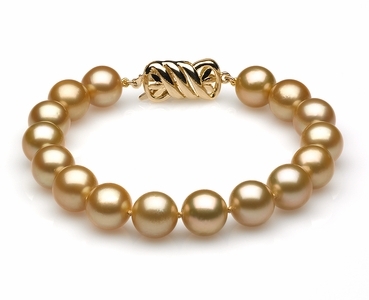 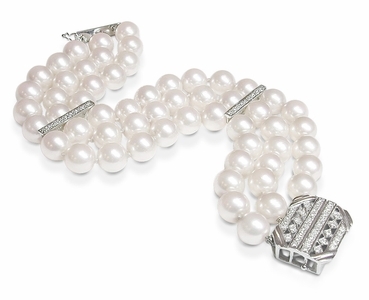 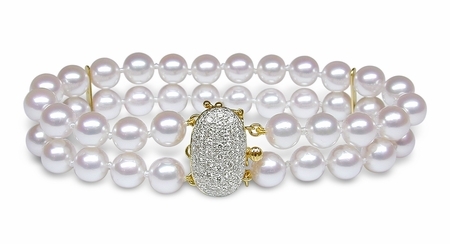 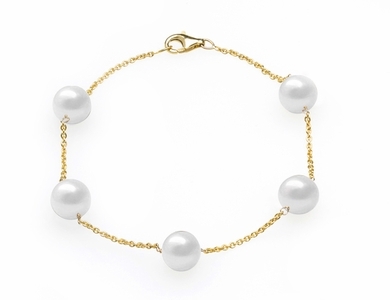 Generally speaking, the single strand pearl bracelet is the simple classic timeless elegant item. 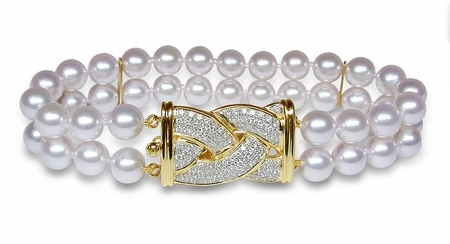 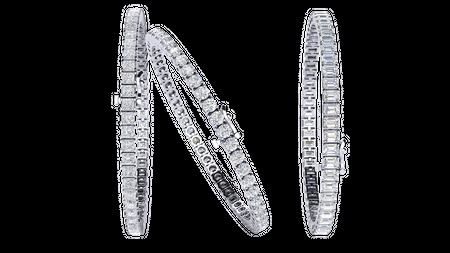 A double strand, triple strand or multi strand bracelet is somewhat more formal and dressy than the simple elegant single strand. 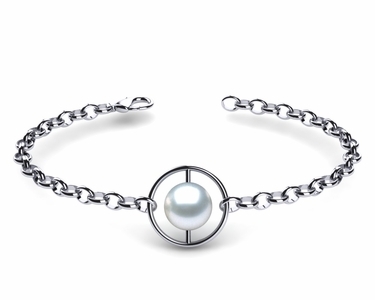 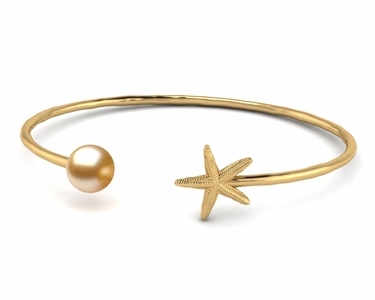 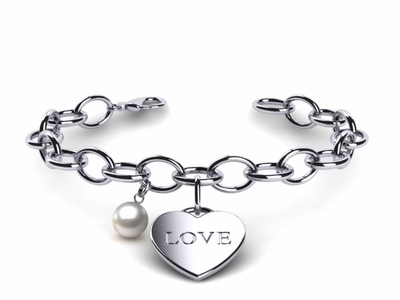 A pearl bracelet is a nice accessory to any jewelry wardrobe; especially if she already owns the matching necklace with the same pearl clasp that is on the bracelet. 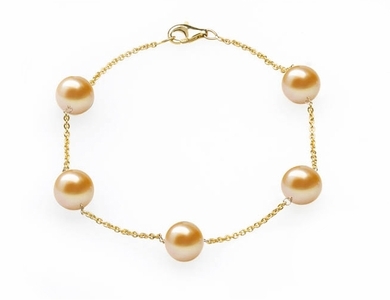 In this way, one can connect the female mechanism of the bracelet clasp to the male mechanism of the necklace clasp to adjoin the to pearl items into a matinee length necklace. 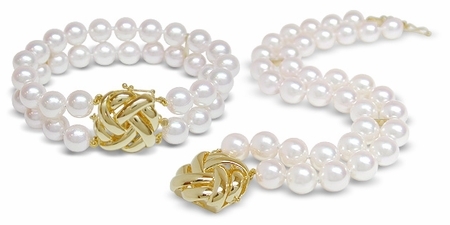 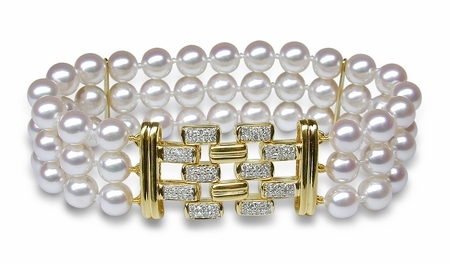 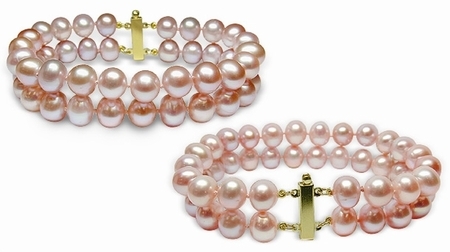 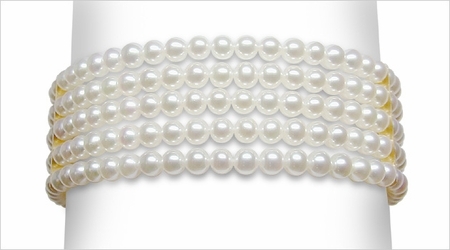 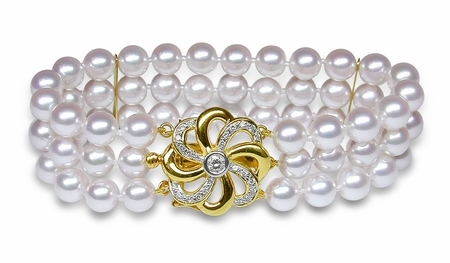 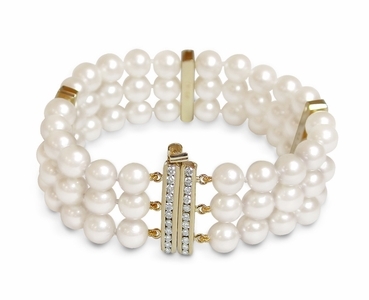 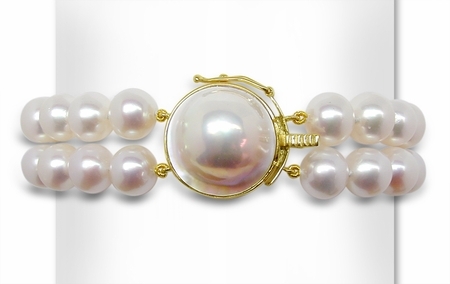 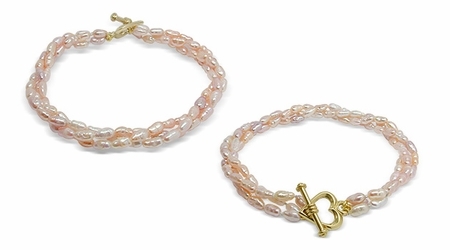 Pearl bracelets are offered in the classic white color. 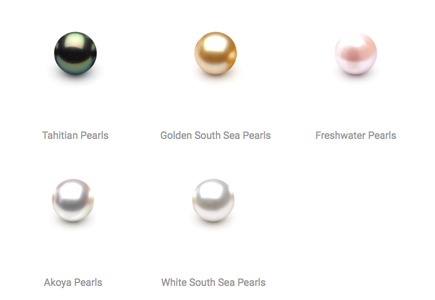 If white pearls are the color you are looking for you can choose among inexpensive freshwater pearls, the classic fine quality Japanese Akoya pearls that are known for their very high luster and the jumbo sized south sea pearls that usually start at 9mm and go up to 12mm. 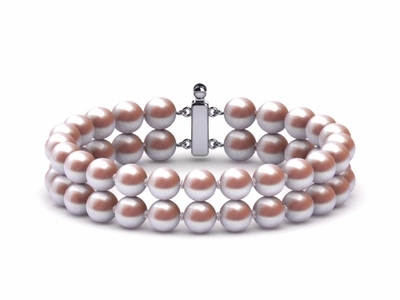 If you are looking for an unusual color pearl, American Pearl offers pink, peach, grey, chocolate and cranberry freshwater pearls. 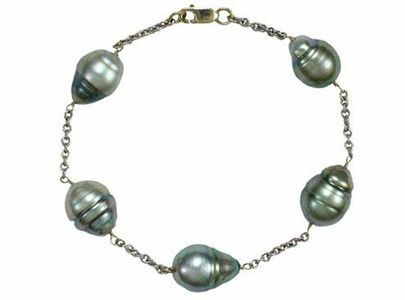 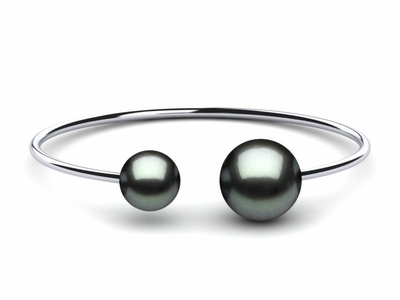 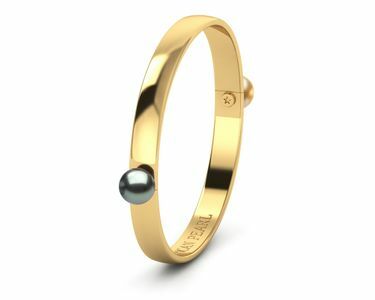 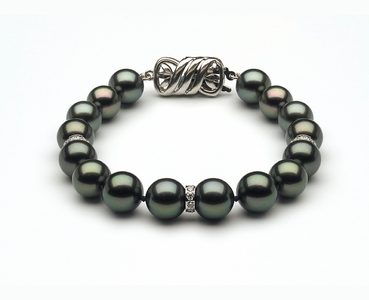 Or if you would like something finer, we offer black color Tahitian pearls or the extremely rare Golden south sea pearls. 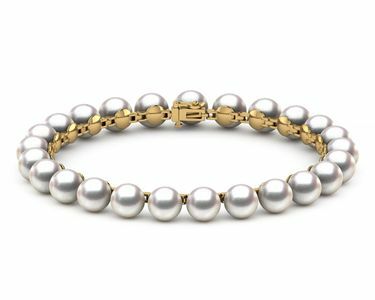 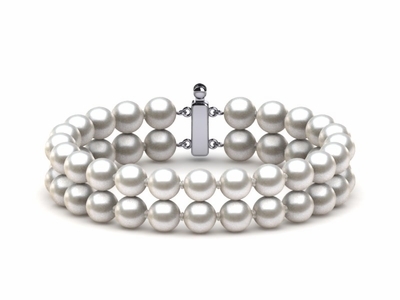 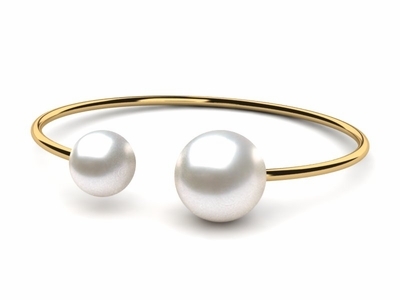 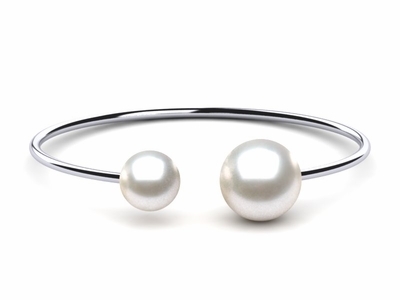 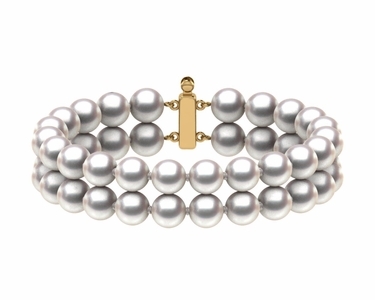 Of course, if there is a bracelet that you are looking for that you do not see on our website, please feel free to phone us and speak to a pearl specialist to have a custom pearl bracelet made to your exact specifications. 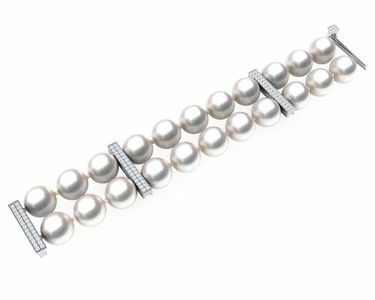 All of American Pearl's pearl bracelet offerings are strung on double stranded silk thread with double knots between the pearls. 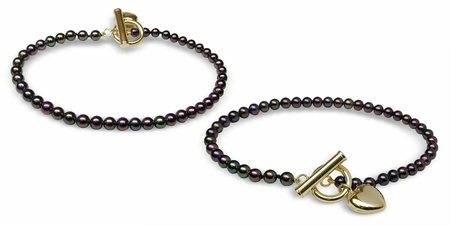 The silk thread is affixed to the jump rings of the clasps using french wire. 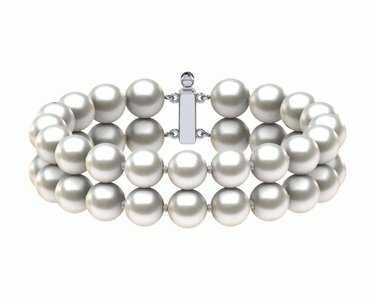 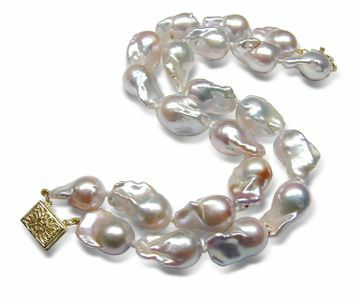 American Pearl also offers an array of shapes for bracelets beyond the classic round pearls such as baroque and drop shaped pearls.